Look... there's some fun to be had here, but the film never really leans in as hard as it should into the "one-legged, ex-special forces turned security expert saving his family in a towering inferno and fighting off a tonne of armed mercs" premise. Dwayne Johnson is as charismatic as always, although I can't help but feel he hasn't truly found his defining action role yet (Hobbs in Fas & Furious comes close). The ending to this whole thing is entirely silly and overthought and ultimately leaves you with that "eh" feeling as the credits role. It’s time to put aside the Chuck Norris jokes and declare that gravity doesn’t affect The Rock; The Rock affects gravity. 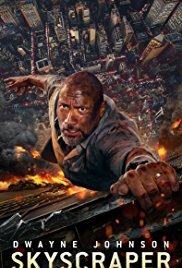 Skyscraper walks a fine line between Die Hard homage and plagiarism but if you just want to see Dwayne Johnson saving the day amidst explosions and eye-rolling stunts then you will love this mindless action film. There are actually a few good scientific tidbits and accuracies in here as well as an interesting criminal technique or two. It’s a shame that there are also flaws that render any credits from them immediately worthless. It’s highly predictable but to be honest, Liz and I had a blast predicting lines and cliched incidents (it even had a Rocky shout out) so would be fun slightly intoxicated. At the end of the day there’s one sentence that will decide whether you’ll see it or not: it’s The Rock.